Happy Friday friends! It's been our first full week in the new house and things have actually been going pretty smoothly! We've hung a lot of items, threw up items we never use, moved furniture around ( you know I'll end up doing this a few times anyways ha ) and love having friends and family over to enjoy our new home. My in-laws are here this weekend and we are so happy to have more guests over! 1. Ozarks - I'm aways so behind on TV shows but when Zach brought up he wanted me to start watching this show with him ( hey oh Season 2 ) I thought why not. I'm hooked you guys! Plus, if you didn't know, I grew up in Naperville, a suburb of Chicago, and that's apparently where the main characters used to live before moving to the Lake of the Ozarks! How hysterical. There are even references to our town like "Naper-thrill" that are in the script and had me rewinding a few times to laugh out loud about. Maybe just me but it's fun ( and intense ) to watch! 2. 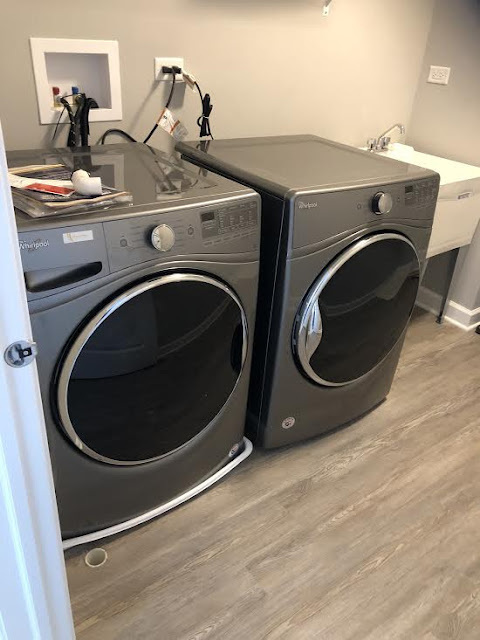 Washer and Dryer - When we built our home, we had no idea the little things that we would love about our new home. Unfortunately, we also didn't realize to ask a few more questions about our appliances. We bought them when we lived in Atlanta and realized that going through our walk through, they had built a dryer for a gas dryer only. We have electric. Grrr. We ended up purchasing a new one of the same model we had because we truly loved ours, and had it come this week. 3. 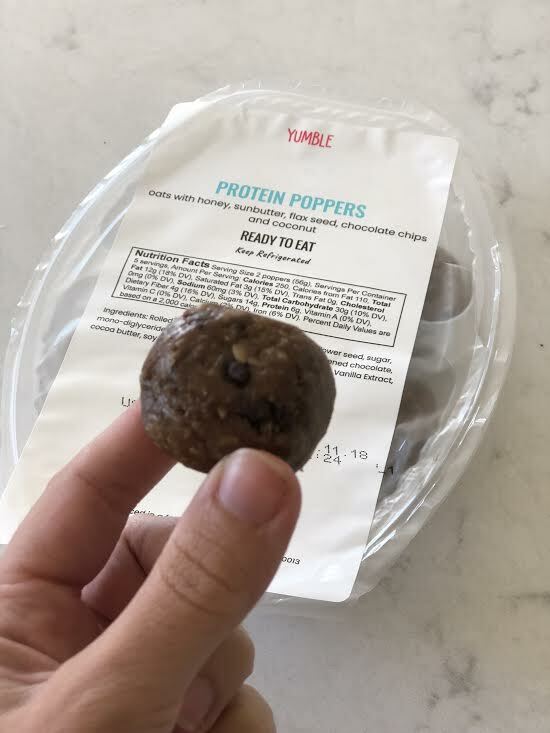 Yumble Protein Balls - I shared about Yumble on my Instagram Stories yesterday and you guys went crazy over it! If you haven't heard, they are a subscription service that sends you delicious meals right to your doorstep. You have the option to pay for 6 meals a week, 12 or 24. Best part ? I have a 30% off coupon for you to use on your first order. Just put in "CaitsCozyCorner30" at checkout plus you can cancel anytime. So far our favorites are the pizza and taco bowls! Soo yummy and perfect to take out of the fridge, microwave and serve! 4. Board and Brush Event- On Tuesday I attended my first Board and Brush event. A girlfriend from high school manages one near our new home so I paid her a visit plus was able to create something perfect for our home! Because it was my first time, I was a little nervous and not sure what to expect. Thankfully, everyone was extremely friendly, helpful and encouraging as we all got to work on our projects. 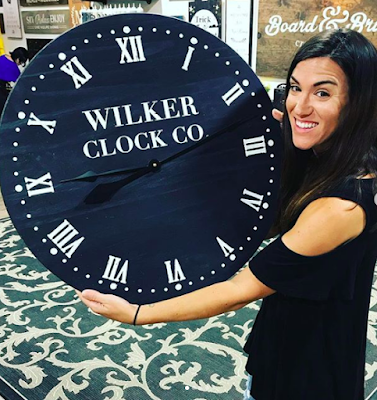 I decided to create a giant clock and I have to say, it turned out better than I imagined! Have you made anything yummy? I have not gotten to sit down to season two of Ozark yet, I'm excited to get back into it. Glad you are enjoying your new home! I also love love that clock! As for my weekend, I plan on enjoying the fall weather and baking! I dream about getting a nice new washer and dryer set! haha Ours are older and came with our house but we won't be replacing yet. I'm glad being in the new house is going well. That board and brush event sounds like such fun! I had no idea you could get gas dryers! That must have been so annoying. At least you were able to get the model you like though! What is Board and Brush event if you don't mind me asking. Its sounds fun to me. Gas dryers?! Never heard of it haha, I'm studying and writing all weekend! I am addicted to Ozark season 1 but for some reason am not to crazy about season 2. You know you're an adult for sure, when new appliances make you happy! lol I get so happy when I get new things for the house. That clock is so neat! It turned out great! That clock is stunning! Love these roundups!